The library stocks approximately 13,000 fiction and non-fiction books as well a number of Encyclopedias and a broad range of periodicals. 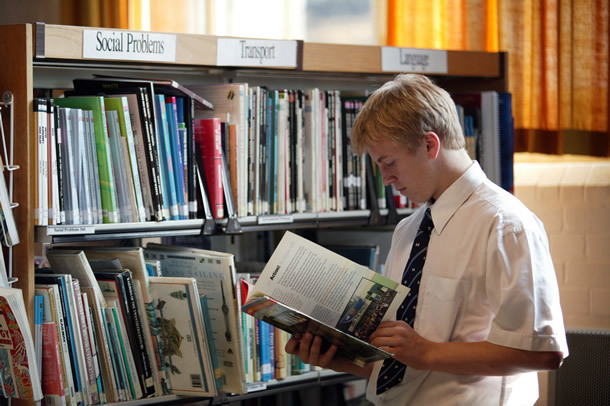 Books are updated regularly to ensure that they are up-to-date and relevant to the pupils. The library also has subscriptions to online resources and is building up a collection of music CDs and DVDs. Pupils in the 1st to 5th forms can borrow up to 4 books/ DVDs/ CDs at any one time. 6th formers and staff can borrow up to 8 resources. Books are loaned for 4 weeks for 1st to 5th forms and 8 weeks for 6th form and staff unless otherwise stated. DVDs,CDs and Graphic Novels are loaned for 2 weeks. If you have any comments on this site please contact the librarian.